Well, it's Thanksgiving here in the US. A while back, I actually thought about how, sometime this year, I'd be writing a post about how thankful I am for Star Trek. And, of course I am. I'm so grateful that this show has been a lasting part of my life and that it's taught me so many lessons about how to be a decent person, how to write, how to get on with my life when everything seemed bleak. I can never forget that. But, as this holiday approached, I found myself thinking more about a newer addition in my life: you. Your continued readership, your comments and the interest you've shown has humbled me. Some of you just showed up. Some of you have been there almost since the beginning. You keep coming back. You keep telling me how much you appreciate what's going on here. So I wanted to let you know that I appreciate you too. More than you could know. As I sit here across the country with holiday stress, spotty wifi, deadlines to meet, and what's turning out to be a pretty terrible cold, what I find myself feeling really grateful for is your support. Thanks for reading. After reading your last few entries and re-watching “Endgame" I totally agree, it’s hard to leave the “Voyager” family behind…but “Enterprise” has a lot to offer too. Loved the Carol Burnett spoof too! Hope you had a nice Thanksgiving. 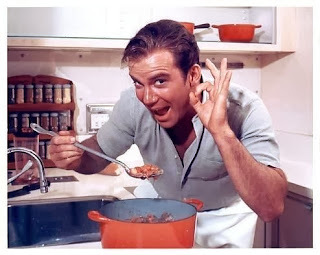 That pic of Bill Shatner reminds me of his video on deep - frying turkeys, from 2 years ago, still on You Tube…pretty funny! Happy Thanksgiving! I hope you got to spend the day exactly as you wanted to.